There was no shortage of bad news for the memory-chip manufacturer in 2015. Here's a look at the worst of it. 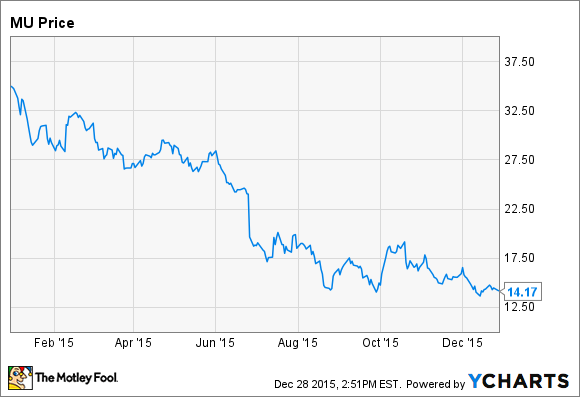 For Micron Technology (NASDAQ:MU) investors, 2015 has been a disaster. The stock has plummeted, losing nearly 60% of its value year to date, as DRAM and NAND prices have fallen faster than Micron could cut costs. While there was hope that the industry had changed, and that Micron's earnings would bottom out in positive territory, the company's guidance for its second fiscal quarter threw cold water on that idea. Micron competes with Samsung (NASDAQOTH:SSNLF) and SK Hynix in the DRAM market, and while the company has argued that consolidation has fundamentally changed the industry for the better, supply and demand still ultimately determine pricing. In January, it was reported that Samsung, the DRAM market leader, was actively purchasing more DRAM equipment in an effort to increase capacity. When supply is greater than demand, DRAM prices can fall rapidly, eating into Micron's profits. In March, IDC cut its 2015 outlook for the PC market, predicting that global shipments would decline by 4.9%. This was particularly bad news for Micron, which depends on the PC for a substantial percentage of its revenue. During the fiscal second quarter of 2015, about $1.8 billion of Micron's $4.2 billion in sales came from the computer and networking segment, which includes both PCs and servers. Shares of Micron tumbled after the company reported its fiscal-third-quarter results, which missed analyst estimates for both revenue and earnings. DRAM average selling price fell by 10% sequentially, while cost/bit declined by just 6%. Guidance for fourth-quarter revenue was also well below expectations. Intel and Micron are NAND partners, but in October, Intel announced that it planned to invest up to $5.5 billion over the next few years to convert a facility in China to support 3D NAND manufacturing. Intel's SSD business has been growing, and it will use the upgraded facility to keep pace with demand. Shares of Micron dropped on the news. With the deal to acquire Micron falling through, the Chinese company changed course, with plans to invest $47 billion over the next five years to build a massive chip business in China. Details are scarce, but the prospect of increased competition in either the DRAM or NAND markets is bad news for Micron. After defending Micron in his second-quarter letter to shareholders, David Einhorn of Greenlight Capital slashed his Micron holdings by two-thirds in November. Micron was a big loser for Greenlight in 2015, and with Einhorn's prediction that profits would bottom out in positive territory turning out to be incorrect, it's not surprising that the hedge fund manager lowered his expectations. The idea that the DRAM industry had changed died when Micron reported its fiscal-first-quarter earnings. The company's results were mixed, but guidance for the fiscal second-quarter called for a non-GAAP loss of between $0.05 and $0.12 per share. The company's language became vaguer, with management stating in Micron's earnings presentation that they were "hopeful" that market conditions would improve in 2016. The last time oversupply plagued Micron, in 2012, the company posted a $1 billion net loss. With no sign of the situation improving anytime soon, and with Gartner predicting worsening DRAM oversupply through 2016, this time doesn't look so different after all.